"No One In Need Among You"
“The poor you will always have with you.” These words of Jesus have often been interpreted to mean that Jesus believed poverty is inevitable. Some people see poverty as an individual issue. Some believe that poverty is a matter of individual sin or moral failure-- that people are poor because they don’t work hard enough… or have made bad choices. 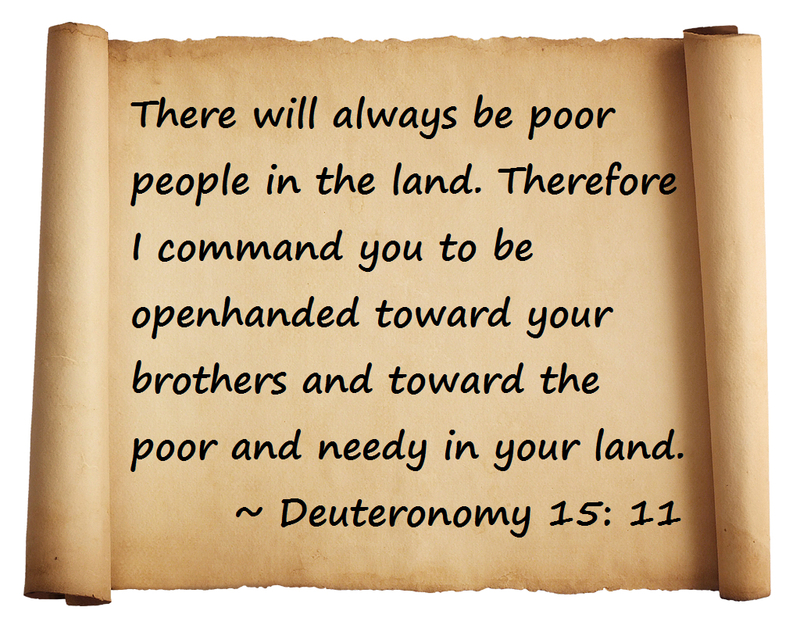 “The poor you will always have with you.” This is one of the most influential passages on poverty in the Bible. So, we need to figure out what Jesus meant. A group of us have been reading the Rev. Dr. Liz Theoharis’ book, Always With Us? as our Lenten study on Tuesday evenings. Liz, who is a Presbyterian minister, has devoted her career to studying poverty and what the Bible teaches about it. She is currently co-director, with Rev. William Barber, of the Poor People’s Campaign. In her book, Liz seeks to show that--far from giving Christian reason to ignore calls for economic justice, the gospel lesson we heard today actually makes “one of the strongest statements of the biblical mandate to end poverty.” She says the passage has been twisted out of context to justify the belief that poverty as inevitable. The story we heard today comes just a few paragraphs after the parable of the Last Judgment in Matthew 25, where Jesus states that when it comes to feeding the hungry, caring for the sick, and visiting those in prison, “just as you did it to the least of these who are members of my family, you did it to me.” So, I think Liz is right when she suggests that this makes it unlikely that Jesus’ words in Matthew 26 should be interpreted as a lack of concern for the poor. 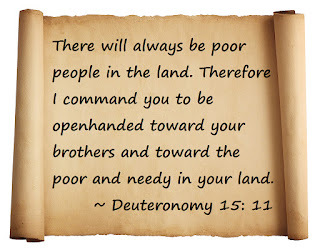 “The poor you will always have with you.” Jesus’ response to the disciples alludes to Deuteronomy 15:1-11, which is one of the most liberating passages in the Hebrew Scriptures. It recalls the Hebrew Shabbat, meaning “rest” or “day of rest,” and especially shemittah, meaning year of remission-- remission of commercial debts and remission of slaves. “At the end of every seven years you must cancel debts…. There need be no poor people among you, for in the land the LORD your God is giving you to possess as your inheritance, he will richly bless you, if only you fully obey the LORD by diligently observing this entire commandment that I command you today…. In other words, if God’s will were being fully obeyed, there would be no poverty. But until that time comes, there will continue to be poor people, and the law must remain in place. The sabbatical year, or shemittah, is mentioned several other times in the Bible. For example, the word of the LORD came to the prophet Jeremiah: “Thus says the LORD, the God of Israel: I myself made a covenant with your ancestors when I brought them out of the land of Egypt, out of the house of slavery, saying, “Every seventh year each of you must set free any Hebrews who have been sold to you and have served you six years; you must set them free from your service.” But our ancestors did not listen to me or incline their ears to me. You yourselves recently repented and did what was right in my sight by proclaiming liberty to one another, and you made a covenant before me in the house that is called by my name; but then you turned around and profaned my name when each of you took back your slaves, whom you had set free….” And the LORD gave Jeremiah a word of judgment and punishment to those who committed these injustices. The Sabbath-- the rest required by God in order to worship God and to protect life and ensure material well-being is one of the earliest laws in the Bible, and it is a consistent theme. In that time, people could be sold into slavery or the might be forced to sell themselves into slavery to settle debts. God commanded the people of Israel to build into their social structures ways for people to have a fresh start. Under God’s rule, the society and economy get a re-set, because God is good and just and promises abundance. When God’s will is being done, it is not acceptable for people to be trapped in generational poverty or slavery. The Torah teaches us that it is important that everyone have a rest--everyone, including slaves, animals. Even the land must have a period of lying fallow. It teaches that piety and economic practice are all part of how we worship God. The way to worship God is to structure society around everyone’s needs. God’s intention with the laws and commandments is to eliminate poverty and inequality on earth. This is about a way of living with shalom justice at the center, a model for right relationship with humanity and God. This is in direct contrast to the values of the Empire. Roman lords were not interested in the well-being, prosperity, and rest of their subjects except to compel more work from them. Liz Theoharis suggests that when Jesus is understood to be “Lord of the Sabbath” in Matthew 12, the title emphasizes that he is on the side of the poor. He is a leader who represents the popular struggles of the poor. He values the lives and livelihoods of the other poor subjects of the Roman Empire and believes they deserve rest and justice. Jesus is also focused on renewing Israel’s covenant with God. In his teaching, he shows that the way to honor God is to structure society around the needs of everyone. Rest and economic justice are consistent themes in Matthew’s gospel. Jesus and his followers were looking for systemic solutions to poverty and dispossession and found them in the prophetic tradition of their faith. Will the poor always be with us? Is it possible that poverty could be eliminated? Or is it an inevitable social problem that we need to manage through charitable action? These are important questions for our faith, and they’re moral questions for our society. As long as we fall short as a society of living in full obedience to the God of love and abundance and justice, we will have the poor with us. And so, we will continue to need soup kitchens and food pantries and homeless shelters and other ways of alleviating the suffering and need of the poor. But, as people of faith and hope, we pray the prayer our Savior taught us, saying, “Thy will be done, on earth as it is in heaven.” I don’t think any of us believes that there are people going hungry or sleeping in boxes on a sidewalk in heaven. So, we need to keep asking ourselves, “What is the world like, if God’s will is being done?” And we need to live into that vision. When we look around, when we hear the facts of poverty, it can feel overwhelming. Over half of all children in our nation are poor or low income. Half of all children will qualify for food stamps before they turn 20, including 9 out of 10 African-American children. In Michigan, one in five children and one in six women live in poverty, and 38,725 veterans live below the poverty line. One in Seven households struggle to put food on the table. Like the people following Jesus, the people who were gathered at Simon the Leper’s house in Bethany a few days before Jesus was executed by the Roman Empire, we may wonder if there’s reason for hope. Jesus came proclaiming the “good news” that everyone is created in the image of God and has worth and dignity. He and his disciples had been demonstrating this good news through sharing meals and conversations with people who were poor and marginalized. Jesus was a teacher…leader…prophet…and ruler of a growing revolutionary social movement of the poor that practiced and proclaimed God’s coming reign of abundance, dignity, and justice for all. This movement was understood by the ruling elite to be in opposition to the Roman Empire and to the parts of the religious establishment that cooperated with the occupying forces. They understood Jesus’ condemnation of the practices and people that exploit and exclude the common people as a threat to the status quo, and they were plotting to get rid of him. This is the background for what was happening in Bethany when the unnamed woman anoints Jesus with a very expensive ointment. The anointing is a turning point in Matthew’s Gospel. The Hebrew word for “Messiah” means “anointed one. As kings were anointed by prophets, so this anointing is a sign that Jesus is ruler of God’s Kingdom. The anointing also anticipates Jesus’ death and burial. Jesus was betrayed, unjustly condemned for blasphemy and sedition, and crucified. But the story doesn’t end with death. On the third day, Jesus was raised from the dead, showing that God’s powerful love is stronger than sin and death. Jesus promised his disciples that he wouldn’t leave them alone, that the Holy Spirit would be with them to guide and empower them to carry on his mission. In Luke’s account of the early church, we hear that those who welcomed the gospel and received the Holy Spirit at Pentecost devoted themselves to the apostles’ teaching and fellowship, to the breaking of bread and prayers. All who believed were together and had all things in common. They would sell their possessions and goods and distribute the proceeds to all, as any had need. Day by day, as they spent much time together in the temple, they broke bread at home and ate their food with glad and generous hearts, praising God and having the goodwill of all the people. Fifty years later, the work is not done. Can we say we believe in the in-breaking of God’s kingdom in the world, if we don’t commit ourselves to bringing it to people who lack basics like safe water to drink, adequate shelter, good education, health care, and a chance to have a place at the table in our society? As the people of God, we are called to share the good news of God’s love with all the people God loves. We’re called to help the world recognize the miracle of grace and abundance that is offered to all people in the life, death and resurrection of Jesus Christ. We don’t have to do it alone. The good news is that in this broken and fearful world, the Spirit gives us courage to pray without ceasing, to witness among all peoples to Christ as Lord and Savior, to unmask idolatries in Church and culture, to hear the voices of peoples long silenced, and to work with others for justice, freedom, and peace. Liz Theoharis, Always With Us? What Jesus Really Said about the Poor. William B. Eerdmans Publishing Company, 2017. Jeremiah 34:13-22. See also Exodus 23:10-11; Leviticus 25:1-7; Nehemiah 10:32; 2 Chronicles 36:20-21. Theoharis, Kindle Edition, Loc 1510 / 31%. Theoharis, Kindle edition, Loc 3045 / 64%.